The Monday Snapshot – Neiiiighs! How fun! She is just the cutest! This is the perfect Monday morning laugh! Poor girl! And I like your app, that sounds great!!!!! So funny! Lyla LOVES animals a d pets every single one we ever see. I spent the entire afternoon petting huge dogs I was afraid of just to make sure they would be ok with her on Saturday. 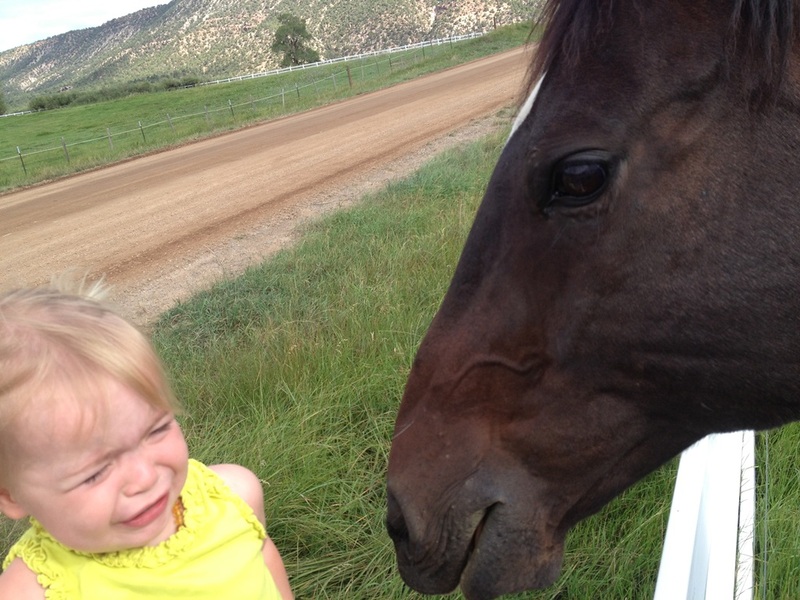 I agree, Stella, horses are scary! Don’t listen to Courtney, Stella! Horses are the BEST. 😉 But I can understand that as a 3 foot toddler, they probably do seem a little imposing at first. LOL, ya, I grew up on a farm with horses, but I guess their size is intimidating at first. Hopefully she will grow to love them! Aww poor Stella! I can understand that though. That horse must have seemed huge from her level!! SUCH a cute pic! Priceless! This reminds me so much of Harriet! We have horses right next door. She talks a big game when they’re far away, but when they get close, she gets really nervous. I don’t blame her though! The other day, one of them bit me on the back of the arm and it hurt like CRAZY!